I'm wearing lots of layers underneath this outfit, a vest, long sleeved black top, two pairs of tights! I get cold easily. I love that shirt, it happens to be one of those long dress style shirts you are supposed to wear with leggings but for some reason they always look huge on me like that. It is really thick and comfortable and has real long sleeves not like those stupid 3/4 length styles they seem to only make nice shirts in nowadays. The culottes I got dirt cheap. 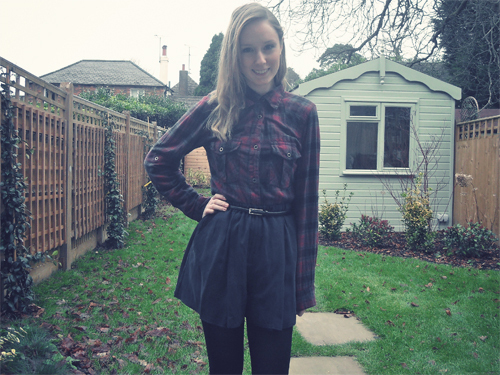 Come to think about it this outfit only cost me £14, yay for cheap clothes! 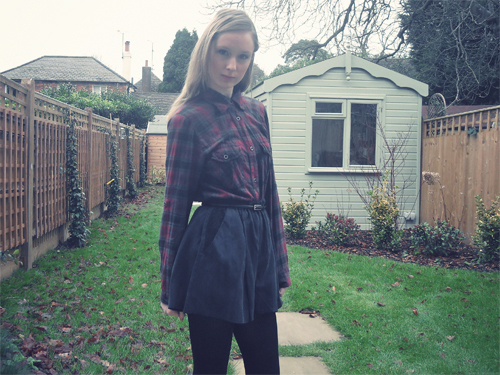 The culottes are a few sizes too big for me so I had to do some serious editing such as making an elastic waist. They're made out of a really nice silky material and have lace details on the pockets. 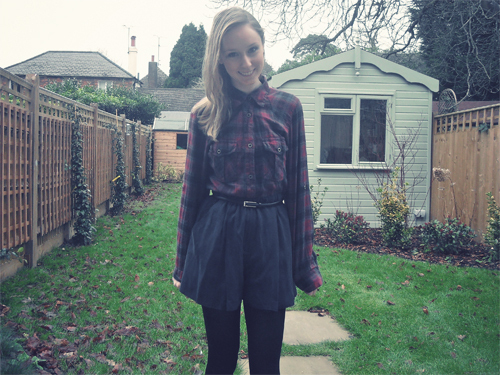 The belt is from mum, I think its from the 1990s. I love thin waist belts! This one is for trousers to be worn on the hip so I edited it using my book making hole maker to add extra holes. I ordered some asos goodies the other week and they've not arrived yet I'm getting so impatient. There are some xmas pressies in the order as well so I seriously hope it hasn't got lost. I brought some glasses that would have gone perfectly with the above outfit, of course I could have just worn my real ones but they've had too much exposure on here lately. Besides, they may have looked a little over the top and I could have ended up looking like a school girl.